Beta-alanine is a popular supplement among athletes and fitness enthusiasts. That’s because it’s been shown to enhance performance, as well as benefit overall health. This article explains everything you need to know about beta-alanine. Beta-alanine is a non-essential amino acid. Unlike most amino acids, it is not used by the body to synthesize proteins. Instead, together with histidine, it produces carnosine. 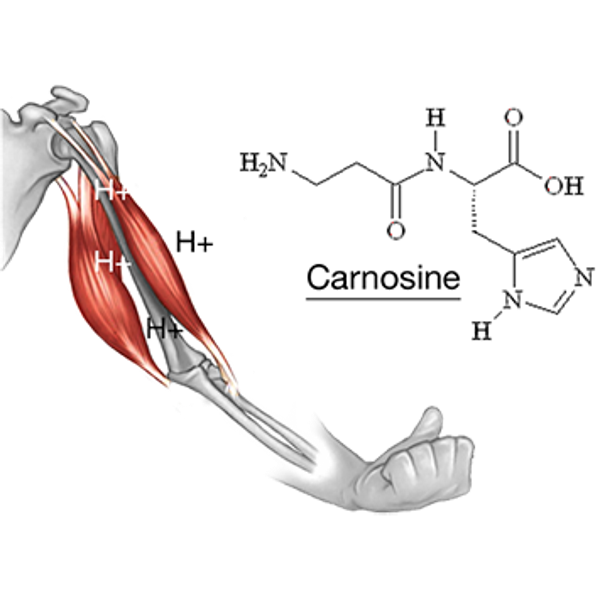 This is then stored in your skeletal muscles (1). Carnosine reduces lactic acid accumulation in your muscles during exercise, which leads to improved athletic performance (2, 3). Bottom Line: Beta-alanine is a non-essential amino acid. The body uses it to produce carnosine, which helps improve exercise performance. In your muscles, histidine levels are high and beta-alanine levels are low. The low levels of beta-alanine limit the production of carnosine (1, 4). Supplementing with beta-alanine has been shown to elevate carnosine levels in muscles by 80% (4, 5, 6, 7, 8). Glucose is broken down: Glycolysis is the breakdown of glucose, which is the main source of fuel during high-intensity exercise. Lactate is produced: As you exercise, your muscles break glucose down into lactic acid. This is converted into lactate, which produces hydrogen ions (H+). Muscles become more acidic: The hydrogen ions reduce the pH level in your muscles, making them more acidic. Fatigue sets in: Muscle acidity blocks glucose breakdown and reduces the muscles’ ability to contract. This causes fatigue (8, 9, 10). Carnosine buffer: Carnosine serves as a buffer against the acid, reducing the acidity in muscles during high-intensity exercise (8, 11). Since beta-alanine supplements increase carnosine levels in muscles, they help the muscles reduce their acid levels during exercise. This leads to reduced fatigue. Bottom Line: Beta-alanine supplements increase carnosine, which reduces the acidity in muscles during high-intensity exercise. How Does Beta-Alanine Affect Athletic Performance and Strength? Beta-alanine improves athletic performance. It can reduce fatigue, increase endurance and boost performance in high-intensity exercises. Studies have shown that beta-alanine helps increase the time to exhaustion (TTE). In other words, it helps you exercise for longer periods at a time (3, 8, 12). A study of cyclists found that 4 weeks of supplements increased total work completed by 13%. It increased by an additional 3.2% after 10 weeks (5). Similarly, 20 male subjects on a comparable cycling test increased their time to exhaustion by 13–14% after 4 weeks of beta-alanine supplements (13). In general, muscle acidosis limits the duration of high-intensity exercise. For this reason, beta-alanine specifically helps performance during high-intensity and short-duration exercise lasting one to several minutes. One study showed that 6 weeks of beta-alanine increased time to exhaustion from 1,168 to 1,387 seconds during high-intensity interval training (HIIT) (14). Another study found that 18 rowers who supplemented for 7 weeks were 4.3 seconds faster than the placebo group in a 2,000-meter race lasting over 6 minutes (15). Beta-alanine can also delay fatigue by increasing ventilation rate by 13.9% (16, 17). For older people, it can help increase muscle endurance (18). In resistance training, it can boost training volume and reduce fatigue. However, there’s no consistent evidence that beta-alanine improves strength (19, 20, 21, 22). Bottom Line: Beta-alanine is most effective in exercises lasting one to several minutes. It can help reduce fatigue, while increasing exercise capacity and muscle endurance. Some evidence suggests that beta-alanine may benefit body composition. One study showed that 3 weeks of supplements increased lean muscle mass (17). Similarly, 4 weeks of supplements helped 32 females reduce their body weight and body fat while also increasing lean muscle mass (23). It’s possible that the body composition improvements seen in these studies are mainly due to the increase in exercise volume that come from the supplements. However, some studies showed no significant differences in body composition and body weight after treatment (22, 24). Bottom Line: Beta-alanine can help increase exercise volume. This could lead to increases in lean body mass and reductions in body fat, although the evidence is mixed. Beta-alanine increases carnosine levels, which may have several health benefits. Interestingly, animal and test-tube studies show that carnosine has antioxidant, anti-aging and immune-enhancing properties. However, humans studies are needed. The antioxidant benefits of carnosine include neutralizing free radicals and reducing oxidative stress (25, 26, 27). Carnosine also prevents changes in the structure and function of proteins in the body. This may give it some anti-aging properties (28). Moreover, carnosine seems to elevate nitric oxide production. This may help against the aging process and improve immune function (29, 30). Lastly, carnosine increases the quality and function of muscles in the elderly (18, 31). Bottom Line: Carnosine has antioxidant, anti-aging and immune-enhancing properties. It also benefits muscle function in older adults. Breaking down both carnosine and anserine can produce beta-alanine. The top food sources are meat, poultry and fish. As a result, vegetarians and vegans have about 50% less carnosine in their muscles compared to omnivores (32). Despite these animal foods containing carnosine, they do not contain enough to maximize levels in the body. Bottom Line: Beta-alanine can be obtained from carnosine-rich foods such as meat, poultry and fish. It is generally advised to take 2–5 grams daily (33). A 40–60% increase in muscle carnosine concentrations are often seen after 4 weeks of supplements (34). Consuming beta-alanine with a meal can further increase carnosine levels (34). Bottom Line: It is generally recommended to consume 2-5 grams of beta-alanine daily. Taking it with a meal may be even more effective. The most common side effect of beta-alanine is paraesthesia. This is an unusual sensation typically described as “tingling of the skin.” It’s usually experienced in the face, neck and back of the hands. The intensity of this tingling increases with dosage size. It usually starts with doses of 800 mg or higher, and disappears 60–90 minutes after consumption (3). There is no evidence that paraesthesia is harmful in any way (35). Another possible side effect is a decline in taurine levels. This is because beta-alanine can compete against taurine for absorption in the muscle. In animal studies, beta-alanine has been shown to decrease taurine levels by 50%. Bottom Line: Side effects include tingling and decreases in taurine. The data is limited, but beta-alanine seems safe for healthy individuals. Beta-alanine is often combined with other supplements. These include sodium bicarbonate, creatine and various pre-workout supplements. Sodium bicarbonate (baking soda) enhances exercise performance by reducing acid in the blood and muscles (3). Many studies have analyzed the combination of beta-alanine and sodium bicarbonate. The results suggest some benefits from combining the two supplements, especially during exercises where muscle acidosis inhibits performance (36, 37). Creatine helps high-intensity exercise performance by increasing ATP availability. When used together, creatine and beta-alanine have been shown to benefit exercise performance, strength and lean muscle mass (38, 39, 40). Pre-workout supplements often contain several ingredients proven to enhance exercise performance (3). Beta-alanine is often added to these supplements in doses of 2–4 grams. Studies have shown increases in strength, power output and lean muscle mass after using pre-workout supplements for at least 4 weeks (41, 42, 43, 44). Bottom Line: Beta-alanine may be even more effective when combined with a pre-workout supplement, sodium bicarbonate or creatine. Beta-alanine enhances performance by increasing exercise capacity and decreasing muscle fatigue. It also has antioxidant, anti-aging and immune-enhancing properties. You can get beta-alanine from foods that contain carnosine or through supplements, with the recommended dose being 2–5 grams daily. Although it causes tingling in the skin, beta-alanine is considered to be a safe and effective supplement to boost exercise performance.